We celebrated our father�™s 60th birthday this month. There was a vedic ceremony to commemorate the occasion, shashtabdi poorthi (completion of 60 years) in the holy town of Shringeri, followed by a traditional lunch party in our hometown. A team of four cooks, cooked thirty two traditional South Indian Brahmin dishes for five hundred people in three hours. I love the energy in these ceremonial kitchens where cooks create dishes of mammoth proportions with amazing accuracy, no trial and error and no in between tasting sessions as the food prepared is to be offered to the lord before it is served to the others. I was in and out of the kitchen, chatting up with the cooks and greeting and meeting guests in between. The lunch was served on fresh banana leaves and unfortunately I don�™t have a picture of it to show you. 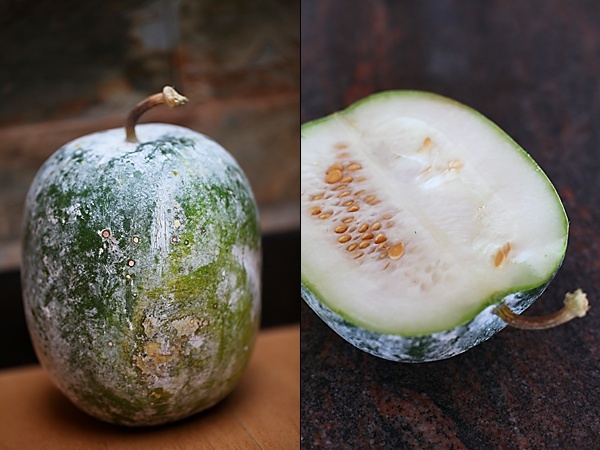 All the guests relished the meal, but what stood out was this halva made out of ash gourd or white pumpkin. This golden coloured, glistening nectar, studded with cashews and raisins was like manna from heaven. The following day, on the behest of my mother who has an eye for spotting unusual and unique things, my sister and I made a trip to the local market, a place which we never ever visited when we stayed in our hometown only to discover rare and precious vegetables and moments. 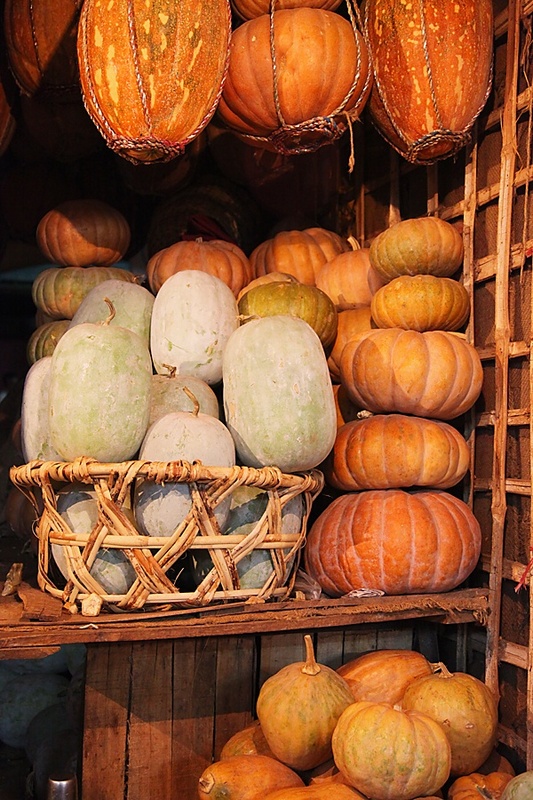 What stood out was this quaint looking store with a gorgeous display of the local varieties of pumpkin. 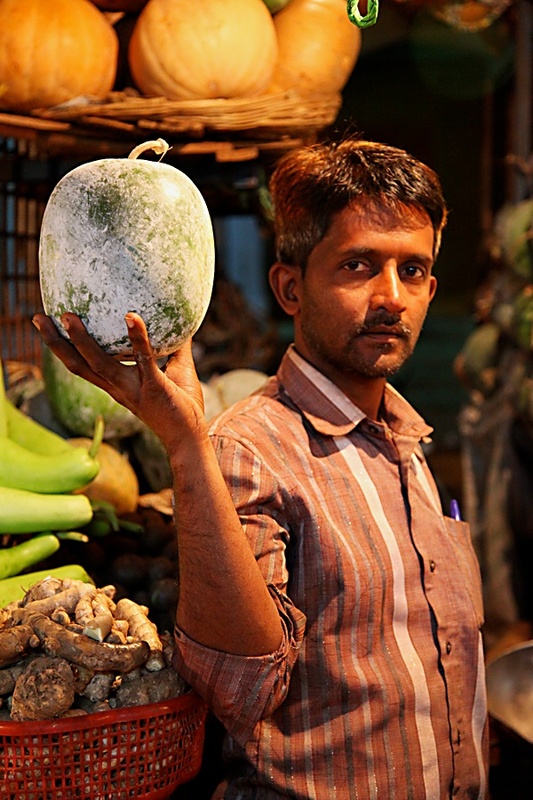 After capturing a few shots, I bought one white pumpkin or ash gourd from this vendor, who picked out the best from his lot for me. 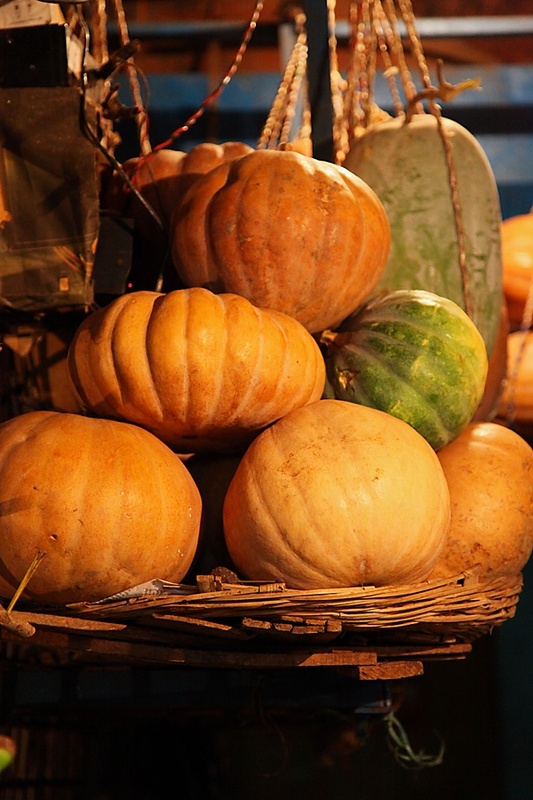 White pumpkin is also known to have great medicinal and nutritive values. This is a perfect dessert with a traditional Indian menu, great served at tea time or with brunch for any special occasion. For a western menu try serving a few spoons of this warm halva over a scoop of good vanilla or butterscotch ice cream. If you want a twist to your thanksgiving meal, then you could serve this traditional Indian sweet, with a lineage and history that is 5,000 years old. You and your guests are sure to be sweetly surprised at how absolutely delightful and divine every morsel is! In a mortar, place the saffron and put in the hot water. After 10 minutes, grind to a paste using a pestle. This will reveal the vibrant hue of saffron. In a wok or kadhai, place the grated pumpkin and over low heat cook until the water evaporates and the pumpkin is dry, this should take about 5 minutes. 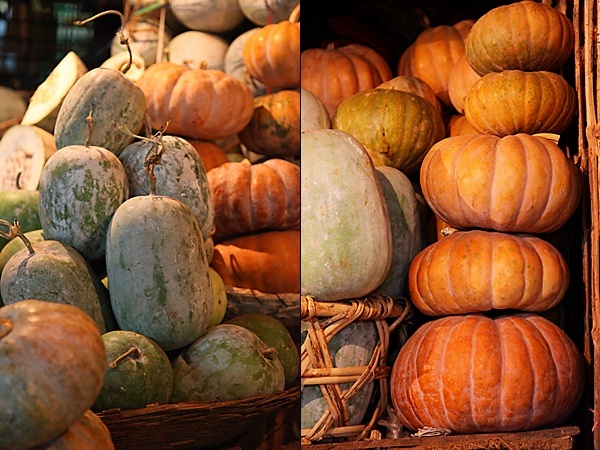 Make sure that the pumpkin is stirred constantly, if not there is the danger of it getting burnt. Once the pumpkin is dry, add the sugar, the saffron mixture, increase the heat a little and cook until the sugar melts. Decrease the heat a little and cook until the mixture is a deep golden colour and dry. In a small wok, heat the ghee and add the cashews and raisins and fry until they are golden in colour. Stir in the ghee, along with the dry fruits to the pumpkin and cook until the mixture starts to leave the sides of the pan. Stir in the fragrant cardamom powder. This can be made ahead and stored in the refrigerator. It stays fresh for upto a week in the refrigerator and a month in the freezer. Tastes best when warm or at room temperature. Can be easily doubled, tripled or quadrupled for a larger crowd. Our best wishes to your dad on his shashtipoorti. My best wishes to your dad, u r really blessed..
Halwa looks absolutely irresistible and super delicious.. 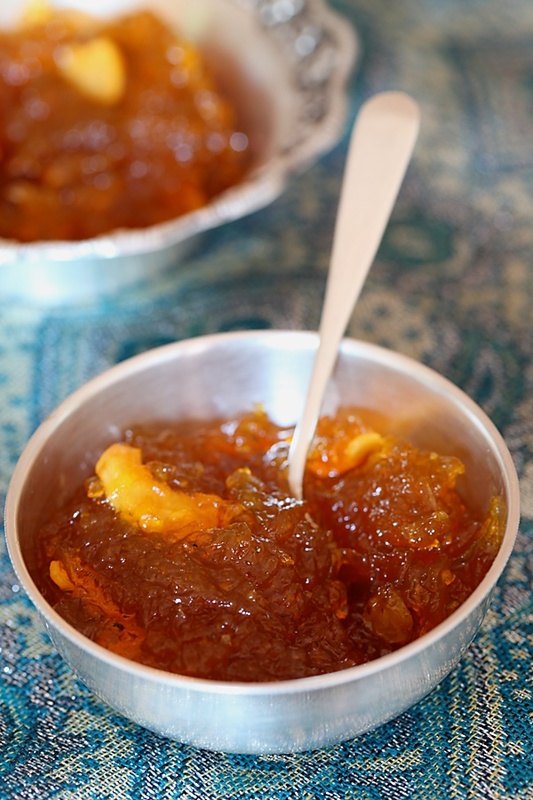 This is one of my favorite halwas..we call this kasi halwa…looks really mouth watering and Best wishes to ur dad..
Drooling over pics 🙂 Thx for sharing a traditional keeper recipe! A very warm birthday wish for your dad. Your pics have a traditional celebratory feel to them. Such wonderful pictures of your hometown and farmers' market! 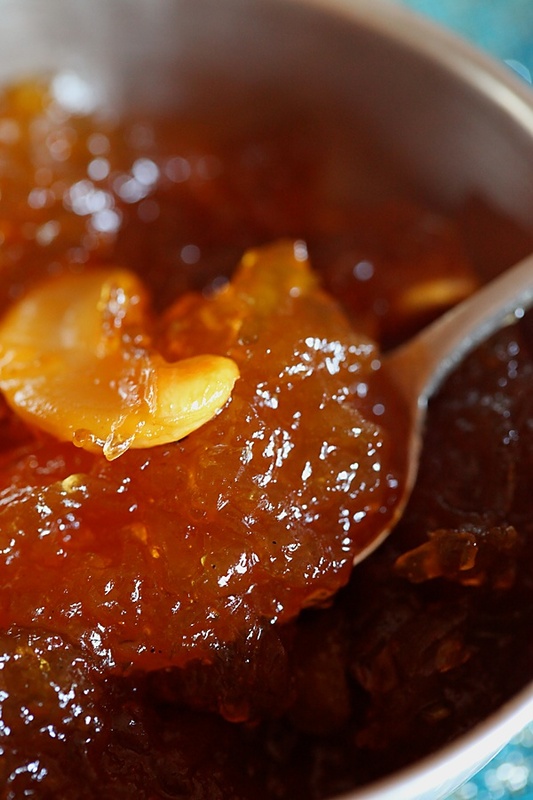 The Halwa looks absolutely yummy, with a perfect tempting glaze. Warm wishes to your dad. Chinmayie, Reva, Priyanka, Priya, Pratibha, Vidya, Sharmilee, Astute, Garima, Sanjeeta: Thank you everybody for your wishes. Priyanka: Yes…it is really amazing how the white pumpkin turns golden after it is done. We offer all the food first to the lord in all the family functions and also at home each day. It is a custom of honouring the Supreme Lord who bestows all the grains and other raw materials from which delicious food is made and savoured by us humans. We used to offer food to God only during festivals but its been a year now that even I offer food to God first and then have it. So no onion or garlic. But usually for a big feast I dont think anyone used to do it only that my husband insisted for my toddlers first bday.I remember as a child I used to always tell my mum that the prasad always tastes so good, now am enjoying it everyday.There are so many customs and rituals that we follow but the next generation modifies it.Its necessary to pass them on and hats off to you that you are still following them.And ur website is really a gr8 help for me. Keep up the gr8 work. Wow. What awesome clips and such quick work and research after the lunch. Great going, Anu. Beautiful post Anu! 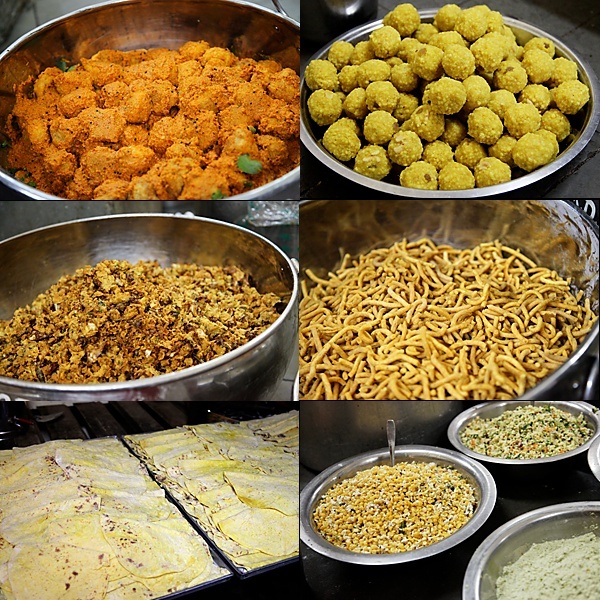 It's really surprising how the cooks in India cook such delicious and varied meals to hundreds and thousands with such accuracy! I have always been amazed by them! Just a thought – It would have been even more good to see some pictures of them cooking in those huge vessels… May be in the coming posts 🙂 Wishing your father a very Happy Shshtabdi poorti! I tried this recipe and when I added ghee towards the end, the whole mixture was floating in ghee. Is it ususally that way or should I add less ghee. Also, the sugar kind of crystallized and the halva became very hard after it cooled. Until then, it looked really nice and soft. Hiranmayi: Looks like you overcooked the halva, you need to cook it until it starts to pull off from the sides or else it would crystalize. Alright. And the ghee part? The whole mixture was floating in ghee. Is it usually that way or should I add less ghee? Thank you:). Also, could you please post a recipe for kaju katli? Can't believe that's white pumpkin in the halva! Hiranmayi: If you add the ghee at the right stage then it usually gets absorbed into the halva. Use less ghee next time if felt this was too much. Thanks:). Will try it again and let you know. Hi anu,I made this yesterday and we had it for the first time. It was absolutely delicious and the best halva we had ever had. Thanks for the wonderful recipes and the inspiration for me to cook. Arthy: Awesome! So glad to get feedback from you on this recipe which is quite close to my heart! 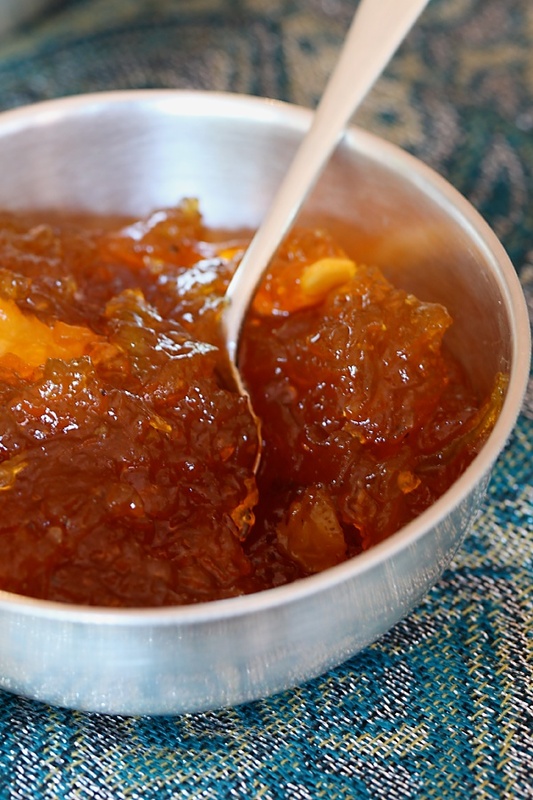 Could one use the same recipe for dudhi halwa? Falguni: You are welcome! Hope your friend recovers well. Khan: You are talking about dudhi halva. It is made by adding khowa in the end. This is a very traditional recipe and there is no khowa in it. Tried this halwa with half the sugar and little butter. Came out really well. Thank you for posting. Ash gourd halwa's one of my fav. Your presentation only makes one feel how great this recipe may taste…. 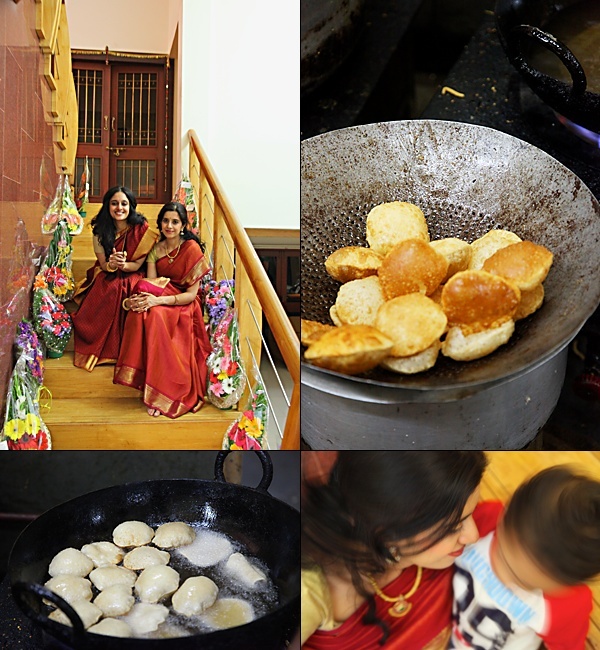 I wish to request you to post some more great recipes from south..
bhavi: You are most welcome. Will definitely post more South Indian dishes. I already have a many of them. Do take a look in the recipe index section. I have tried this recipe and it has come out very well! Aparna- Good to know that!